Pardeshi S*, Swaminathan G**, Warke HS***, Mayadeo NM****. Obstructed labor carries a high risk of maternal morbidity and mortality and is prevalent in the developing world. Common causes include congenital fetal abnormalities like polycystic kidneys, hydrocephalus, hydronephrosis, locked twins, uterine abnormalities, contracted pelvis & maternal pelvic tumors. A case of Prune belly syndrome diagnosed immediately after delivery is presented here. It had led to obstructed labor. She was successfully managed by trans abdominal tapping of the cystic masses following which she delivered vaginally. Obstructed labor is uncommon in developed countries. Obstructed labor with a dead fetus is a reality and is known to cause maternal morbidity and mortality in developing countries. Various maternal and fetal causes have been identified. [1,2] Fetal urinary tract abnormalities can cause obstructed labor and in developing countries, many patients present in active labor with no previous antenatal visit. The anomalies are then detected only when they cause obstructed labor. 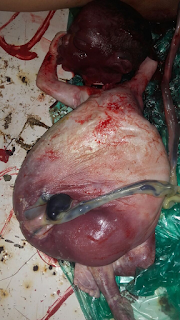 A 22 year old primigravida was referred from a rural hospital to our tertiary care hospital in view of obstructed labor with fetal head and upper limbs delivered out of the introitus. She, a migrant laborer, was completely unregistered & uninvestigated. She went to the nearby rural hospital with complaints of pain in abdomen one day prior to referral. First stage of labor was uneventful. However progress of labor in the second stage was arrested after the delivery of the fetal head and both upper limbs for which she was transferred to our tertiary care center for further management. She reached our center about 7 hours after obstruction. On examination patient was dehydrated, pulse rate was 106 beats per minute and blood pressure was 110/70 mm of Hg. Patient’s heart sounds were normal and the chest was clear. Patient was in distress due to pain. Mild pallor was present. Per abdominally uterus was full term with fundal height of 38 cms. She was getting good uterine contractions. Fetal heart sounds were not heard with stethoscope. On local examination, fetal head and both the upper limbs were lying outside the introitus. On vaginal examination, fetal head and hands were visible at the perineum. The cervix was fully dilated with the shoulders at station 0 to +1. In view of the diagnostic dilemma an ultrasound scan to ascertain the cause of obstructed labor was done. Ultrasound (USG) showed massive distension of fetal abdomen caused by multiseptate cystic masses. Probable diagnosis was fetal hydronephrosis and distended urinary bladder. Fetal heart beats were absent. Written consent was taken and ultrasound guided trans abdominal tapping of the cystic masses was done using wide bore spinal needle and IV drip set under all aseptic precautions. About 1.2 liters of fluid was drained. After decompression of the fetal abdomen, the fetal trunk delivered. Congenitally anomalous, male fetus with grossly distended and decompressed abdomen was still born. On detailed examination, multiple abnormalities consistent with Prune belly syndrome were noted. The abdomen was distended with prune-like appearance (wrinkled, loose skin) and absent anterior abdominal wall musculature. The male genitalia were abnormal with a small scrotum with cryptorchidism. The chest was considerably small, consistent with lung hypoplasia secondary to anhydramnios and talipes equinovarus was present. Parents refused an autopsy examination of the fetus. Postpartum period was uneventful. Broad spectrum antibiotics were given and the patient was discharged on 5th post-delivery day. Prune belly syndrome can be diagnosed antenatally by ultrasound. 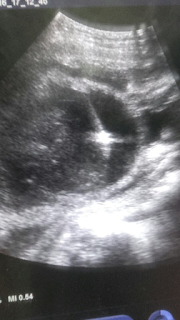 Ultrasonographic findings include oligohydramnios or anhydramnios, hydronephrosis, hydroureter and distended urinary bladder with a thin and attenuated abdominal wall. In the new born, the prune like abdomen usually leads to the diagnosis. The prognosis of this condition is generally poor as many infants are either stillborn or die within the first few weeks of life. The routine use of ultrasound screening for fetal anomalies has resulted in more affected pregnancies being antenatally terminated. If diagnosis of urinary obstruction is done antenatally, it may be possible to perform intrauterine surgery and place a vesicoamniotic shunt to prevent the development of Prune belly syndrome. In developing countries the situation is different where significant number of antenatal women especially from rural areas do not get basic antenatal care. Routine ultrasonography is not done in majority of the cases and patients visit the health care facility only when active labor sets in. In such cases obstructed labor results as in our case. Proper care given antenatally would have led to early detection of the congenital anomaly on a routine ultrasound scan. Our aim of presenting this case was to create an awareness regarding the need for antenatal registration, provision of basic health care facilities, and the importance of routine antenatal ultrasound screening for detection of congenital anomalies to enable their appropriate management. In case the congenital anomaly leads to obstructed labor appropriate management such as transabdominal tapping can be offered rather than performing cesarean section. Availability of ultrasound in rural areas would prevent unnecessary operative intervention in such cases of obstructed labor thereby reducing maternal morbidity and mortality. Nwogu-Ikojo EE, Nweze SO, Ezegwui HU. Obstructed labor in Enugu, Nigeria. J Obstet Gynaecol.2008;28(6):596–9. Ozumba BC, Uchegbu H. Incidence and management of obstructed labor in eastern Nigeria. Aust N Z J Obstet Gynaecol 1991;31(3):213–6. Routh JC, Huang L, Retik AB, Nelson CP. Contemporary epidemiology and characterization of newborn males with prune belly syndrome. Urology 2010;76(1):44–8. Nunn IN, Stephens FD. The triad syndrome: a composite anomaly of the abdominal wall, urinary system and testes. J Urol 1961;86:782–94. Ellison L, Cendron M, Ornvold K, Baker E. Early diagnosis of fetal bladder outlet obstruction. J Pediatr Surg 2000;35(3):513–4. Biard JM, Johnson MP, Carr MC, Wilson RD, Hedrick HL, Pavlock C, et al. Long-term outcomes in children treated by prenatal vesicoamniotic shunting for lower urinary tract obstruction. Obstet Gynecol 2005;106(3):503-8.